of 43 Fetter Lane, London, EC4. Telephone: Central 8551-55. Cables: "Monotype, Fleet, London"
1844 Tolbert Lanston, the inventor of the Monotype hot-metal composition system was born on the 3 February at Troy in Ohio, USA. 1845 Ottmar Mergenthaler, inventor of the Linotype machine, born on 10 May at Hachtel in Germany. 1887 Patents were granted to Lanston for a system composing single metal types mechanically. The Lanston Monotype Machine Co was founded at Washington D.C.
1889 Stanley Morison born on 6 May in Wanstead, Essex. The Linotype Co founded in the UK. 1890 Lanston realised that the method of fashioning and composing type by stamping out characters from cold metal strips had severe limitations. He filed a patent application for a system based on hot-metal casting. It was eventually granted in 1896. The first punch-cutting machine delivered to the Lanston Monotype Machine Co, in Washington. 1896 The first typeface issued by the Lanston Monotype Machine Co in the USA. Lanston was awarded the Cresson Gold Medal for original invention by the Franklin Institute of Philadelphia. 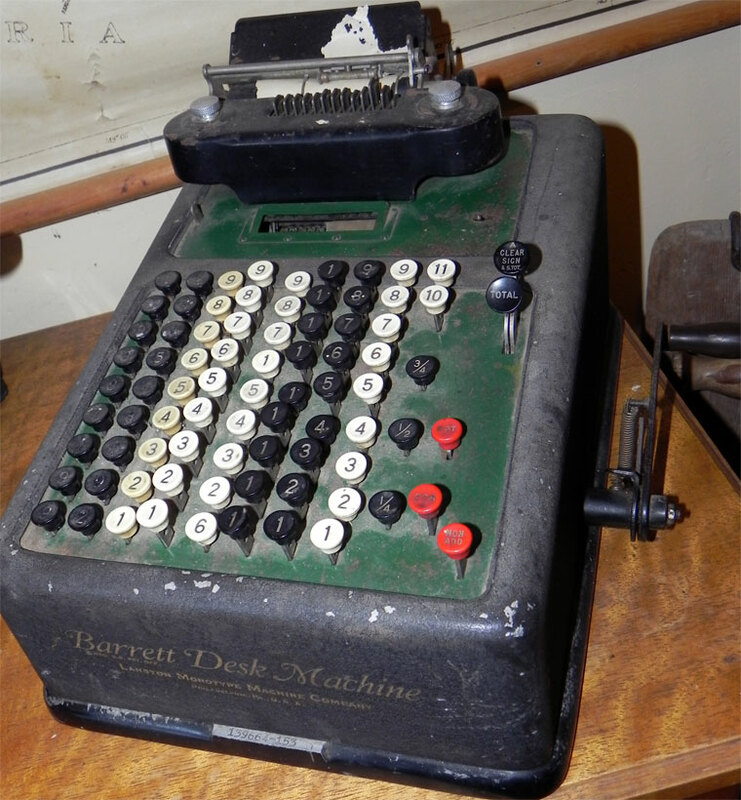 1897 Running short of financial resources, J. Maury Dove and Harold M. Duncan of the Lanston Monotype Machine Co set out to raise money by accompanying four of the Limited Fount Machines to London. On the Atlantic crossing, the two Americans encountered Lord Dunraven, who bought the British and Colonial (except Canada) patent rights to the Monotype system for £220,000. It enabled William Sellers and Co to continue efforts to improve the caster. 1898 First of the Limited Fount Monotype machines delivered to Gibson Brothers in Washington D.C. and to Wyman and Sons in London. 1899 John Sellers Bancroft, a engineer with William Sellers and Co, re-designed the Monotype Caster and restored the complement of characters to that originally intended by Lanston. At the same time a new keyboard was prepared. 1900 The Lanston Monotype Corporation Ltd started construction of a factory on a green field site at Salfords near Redhill. Two buildings were initially erected and finished in 1900 to enable the testing, adjusting, and repairing of Monotype machines arriving from the USA, as well as permitting the manufacture of certain component parts. 1900 The first typeface issued by the Lanston Monotype Corporation was Modern, based on a design by the Miller and Richard type-foundry. Some £50,000 was spent on plant for the new factory at Salfords. Initial installation of Monotype composing machines redesigned by Bancroft at Cassell and Co in London. Harold M. Duncan appointed Managing Director. 1901 Several Monotype systems installed in notable British printing plants, such as Butler and Tanner of Frome, Morrison and Gibb of Edinburgh, and Waterlow and Sons of London. 1902 All Monotype machine moulds made in the UK at the Salfords plant. John Sellers Bancroft joined the Lanston Monotype Machine Company as Chief Mechanical Engineer. Sol Hess employed as the first type designer. 1904 The company took offices at 43 Fetter Lane, off Fleet Street in London. At the same time, the older offices at Drury Lane were vacated. Negotiations began for the British company to secure marketing rights of Monotype machines in Europe and other parts of the world in addition to the UK and its colonies, except for North and South America and Canada. 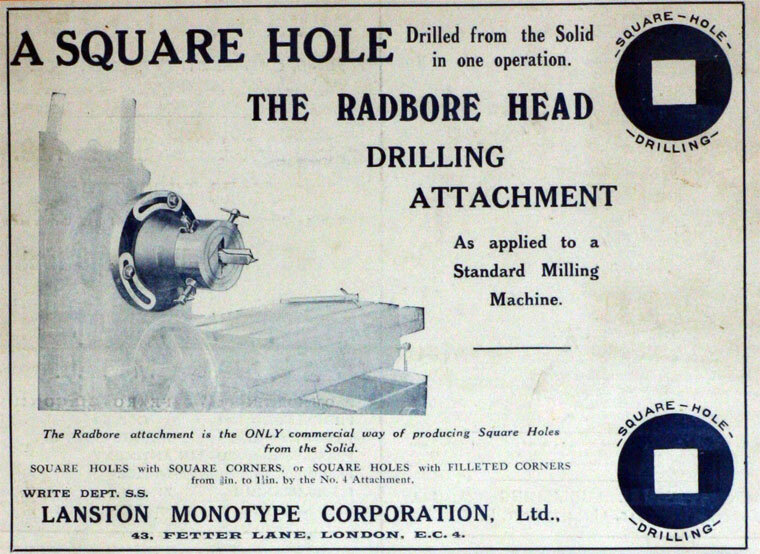 1906 The Monotype factory at Salfords was publicised as making moulds, matrices, repair parts, and slitting and punching paper for keyboard spools. 1908 Punch-cutting machines were made in the Salfords factory, and displaced the earlier Benton-Waldo equivalents. The replacements made 8-times as many punches in a given time than their forerunners and worked to much finer tolerances with less skilled labour. Railway goods siding built to connect with the Salfords factory. Business structure of the Lanston Monotype Corporation was consolidated. 1908 A large battery of machines were installed at The Times newspaper in London; the typeface delivered was the Modern (Series 7) first produced in 1902. 1908 Incorporated as a limited company. 1913 Display Matrix Lending Library established in London by the Lanston Monotype Corporation for the convenience of printers. Hiring a font for one week cost 15 shillings (75 pence). Tolbert Lanston died on 18 February in Washington. 1915 Factory at Salfords given over to the making of precision parts for machine guns which necessitated expansion of the facilities under Government subsidy. Salfords railway station opened to aid war effort and serve the Monotype plant. 1922 Harry J. C. Cust, a founding director of the Monotype Corporation and formerly editor of the Pall Mall Gazette, died. He was an original member of Lord Dunraven’s syndicate that brought the Monotype system to the British market. 1923 Monotype registered as a trademark in Britain after rejection by the authorities in 1907. 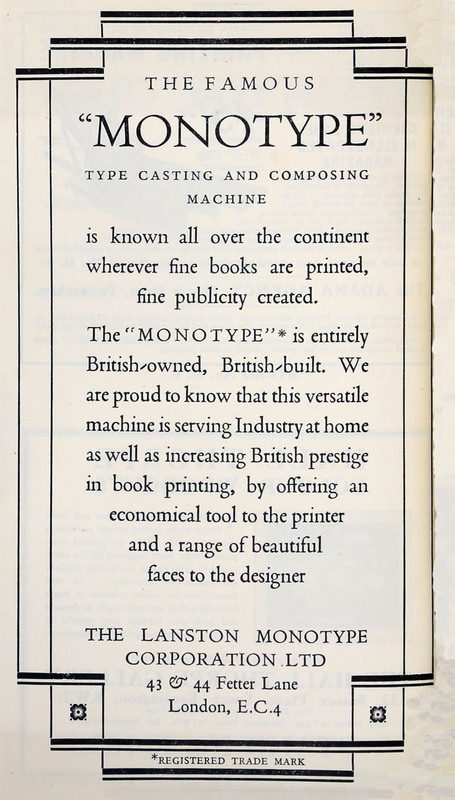 1924 First Monotype machines manufactured wholly in Britain were marketed. 1931 Name of the Lanston Monotype Corporation Ltd changed to the Monotype Corporation Ltd on public flotation in the UK. 1935 Installation of first teletypesetter-operated line-casters in Europe at The Scotsman newspaper. 1938 War Office and the Admiralty in London commissioned Monotype to assist in the manufacture of some intricate and precise gun mechanisms and some observation ‘sights’. 1939 Monotype made initial deliveries of Browning Gun components to the British Government. They were the first of 272,341 supplied by the Corporation. Overall some 18,742,579 parts had been manufactured at the Salfords factory for various armaments by the end of hostilities. 1942 Lord Askwith died on 2 June. He had been appointed to the Board of Directors of the Monotype Corporation in 1898 and became Chairman in 1926. 1944 The Monotype Corporation began research on the project that eventually brought forth the Monophoto Filmsetter. It was to remain an entirely British development. 1955 The Monotype Corporation returned to 43 Fetter Lane in London following the re-building of Monotype House. They acquired Pictorial Machinery Ltd, a manufacturer of graphic reproduction equipment. 1958 First Monophoto Filmsetter installed in Britain by Photoprint Plates Ltd of Basildon, Essex. 1961 The company opened a second factory in Britain at Dunfermline. 1966 London warehouse at Rosebery Avenue closed. 1967 Factory at Salfords stopped making the Thompson Type Caster. 1968 Compugraphic Corporation (now part of Agfa) introduced a series of inexpensive phototypesetting machines which effectively popularized the new process of composition and led eventually to the widespread displacement of hot-metal setting. 1969 Lanston Monotype Machine Co liquidated: the matrix-making equipment and artifacts passed to the American Type Founders Co. Intertype Corporation discontinued manufacture of line-casters in the USA and centralized the declining activity in the UK. 1973 The Monotype Corporation Ltd was acquired by the Grendon Trust (a property investment group) which itself ran almost immediately into financial difficulties and was absorbed by CST Investments. Monotype became the target of insensitive asset stripping and some £2 millions were diverted elsewhere. It was a debilitating year for the Corporation which left the stock market after 42 years as a public company. Two successive Chairmen were appointed over the twelve months. Monotype offices at 43 Fetter Lane closed and sold after an association with the address lasting 68 years. This page was last edited on 28 January 2016, at 16:06.